A file photo of the Laguna Madre. 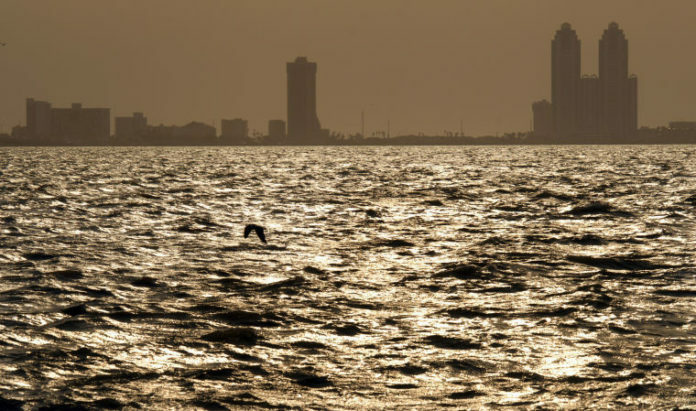 EDINBURG — A new endeavor to identify and prevent pollution of the Laguna Madre is about to begin with the help of a grant received by the University of Texas Rio Grande Valley. The UTRGV civil engineering department received a $200,000 grant from the Texas Commission on Environmental Quality to lead the development of the first Watershed Protection Plan to be run locally. “A watershed protection plan is typically put together to try and address any issues in the water quality or ecology of a basin,” said Andrew Ernest, lead investigator and UTRGV civil engineering department chair. The improvement of water quality will lead to the overall sustainability of the body of water and the usage of it by locals. The Laguna Madre is located along the Gulf of Mexico’s western coast in the counties of Nueces, Cameron, Willacy, Kennedy and Kleberg. It is one of only six hypersaline lagoons in the world and one of the most productive bay fisheries in Texas. Recent studies have found, however, that the lagoon’s is deficient in dissolved oxygen and bacteria, which are necessary to maintain its ecosystem. The initial part of the grant will cover the planning phase of the project, which includes testing the water and all its sources from around the area, as well as gathering all of the stakeholders who Ernest said will ultimately choose what plan of action to take. “In order to create a sustainable change, what you really want to do is create an environment where the people that have and invested interest in the basin … get them working together to where they decide what the best course of action is to protect the basin,” Ernest said. While the UTRGV will provide engineers and their expertise to develop plans of actions, these will first be presented to stakeholders. Only then will engineers move on with investigation, implementation and education phase to ensure that the plan is carried out in the long-term. With the help from the Lower Rio Grande Valley Stormwater Task Force, a joint management task force between UTRGV and Texas A&M-Kingsville’s Institute for Sustainable Energy and the Environment, the university was able to get an additional $133,000 from local municipalities. Most of this money will go toward the planning and investigation phase, and once there is a full plan there will be more opportunities to apply for additional grants considering this is a 10- to 20-year endeavor, he said. This is the first time that such plan will be investigated and carried out fully on the local level, he added, which will not only aid in the efforts to get the communities to buy into the initiative, but also in retaining local talent by getting students involved in the process. “In order for the region to really capitalize on what we are doing, we can’t just protect the environment and develop a sustainable economy, but we’ve also got to change the mindset or convince the kids of the future that this is the place to be,” Ernest said.